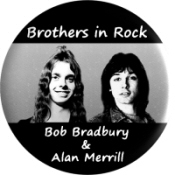 Bob Bradbury And Alan Merrill - Two 70’s chart topping front men from the golden age of Glam together at last! "It's a powerful riff heavy rock song with tons of catchy hooks." "This song has all the vocal hooks, guitar figures and chants that you could want. The best elements of the 70s mixed with modern Y2K production values!" 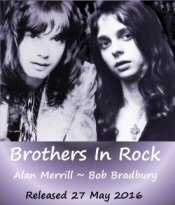 "Alan & Bob are great rock ‘n’ rollers. They've walked the same roads. Not too many people have been down that path." 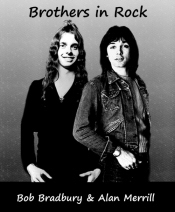 "Plus the two best looking rock band front men of the 70s!" Bringing everything great about 70's music stomping into 2016. And it's long overdue! Vocals and guitars by Alan Merrill and Bob Bradbury. Written and produced by Bob Bradbury. Engineered by Jon Gordon in New York and Bob Bradbury in the UK. 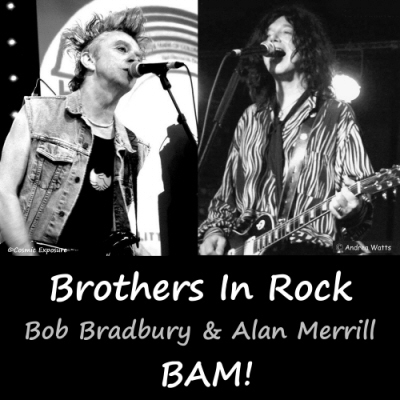 "BROTHERS IN ROCK" released Friday 27th May 2016 on iTunes, Apple Music and Amazon Digital.